Reindeer, Santa Claus, toys and elves are all included in this Christmas story; what more could a believer ask for? 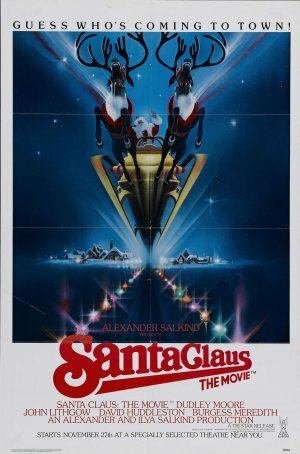 In the present day, Santa Claus is set against a ruthless businessman who tries to take over Christmas. A loyal elf and two young children must help Santa to stop people from all over the world getting hurt. Bright colours, beautiful toys and special flying dust all make this film as visually stunning and magical as Christmas should be for young children. However, it’s the countless elves, with their enthusiastic attitudes and happy faces that make the film really stand out from other Christmas films. In particular, Patch played by Dudley Moore, is a devoted worker and inventor at the North Pole and witty humour and continual elf puns, such as ‘elf confidence’ and ‘elf respect’, make him a lively soul. But more so it is the simple and good nature he brings to his role, and bad luck in his ventures, that make him one of the easiest characters to love from start to finish. A businessman called B.Z., played by John Lithgow, gives a modern twist to the film with his greed to make money, and hatred of children. He uses a revolutionary toy to try and compete with Santa Claus for financial gain, and wants Santa Claus to be finished by the following December. It’s this villainy that makes the film as exciting as it is, with Lithgow making B.Z. the perfect children’s film villain by playing him as a bold and obnoxious individual, continually smoking cigars as a rich high flyer and shouting at everyone around him. The film also focuses on two young children: the first, Cornelia, lives in a grand house, and the second, Joe, is a homeless boy who struggles to keep himself fed. Their relationship develops throughout the course of a year with Cornelia’s kindness being shown by giving Joe leftovers from meals and taking care of him when he’s sick. They also both meet Santa himself, and it is their strong relationship which each other and Santa that will help kids relate to the film more than some other Christmas films containing the red wearing fellow. If you’re after an innocent film about Santa Claus and his traditions for the kids, but still want it to be action packed, funny and entertaining then look no further - Santa Claus: The Movie is certainly one to beat.